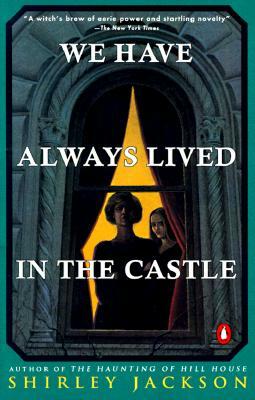 Shirley Jackson’s We Have Always Lived in the Castle, her final novel published in 1962, is a disturbing tale about two sisters who live with their sickly uncle in a secluded estate. The rest of their family has died of arsenic poisoning, and one of the sisters, Constance, was charged with murder, then acquitted. The younger sister, Merricat, narrates the story, and it becomes clear early on that Merricat is disturbed and destructive. Throughout the novel, Merricat talks about her routines, which are unchanging. A lot of the novel, as the title suggests, is about her desire to maintain stasis. She only wants to live with Constance and she wants to protect the estate from any outsiders. Because of this, the ever-changing outside world becomes a threatening place, and Merricat’s life is turned upside-down when their estranged cousin, Charles, comes to visit. This novel was a masterfully-written, haunting story, and when I came to the end of it, I, too, wanted to tuck myself away in a room and hide from all the villagers. Before this, the only Shirley Jackson piece I had read was her famous short story “The Lottery.” If you haven’t read it, you should! It’s a stunningly beautiful short story, full of restraint and suspense. Like “The Lottery,” We Have Always Lived in the Castle also has a gothic, dark tone and relies on a big reveal. One of the things that struck me most about We Have Always Lived in the Castle was the undefined time and place. Although Merricat describes the house and village in the first chapter, we never know exactly which state, which country, or which year we are in. I kept trying to place it. The dialogue sounds archaic at times– but there are also vehicles and highways, so it isn’t that old. “Gray” is spelled the British way (“grey”) but all the other spellings are American. Merricat says she likes Richard Plantagenet on page one, but it doesn’t really come up again. I was grasping at all these mixed messages, trying to make sense of where things were, but it wasn’t clear to me. I realized, though, that the precise place wasn’t exactly important to Jackson. This novel about agoraphobia, escape, magic, and murder seemed to exist outside of time and place. These different hints throughout the novel draw the reader into Merricat’s mind more– and Merricat’s mind is a country unto itself. I loved the way that Jackson paints a world for the reader through Merricat’s myopic eyes in this way. I want to apply this same concept to my writing and work harder to see through my characters’ eyes.